This wonderful ocean art poster was made an Editor’s Pick on Zazzle to be in their curated collections of products – which is absolutely the coolest thing. There are several others that have been given that honor also among my paintings, art and designs on products there. Very nifty. 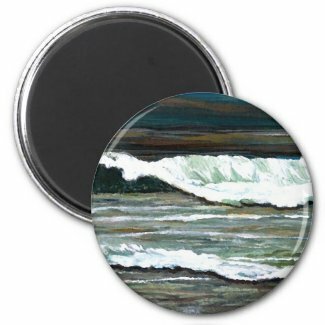 This and other ocean art that I’ve put on posters and prints at Zazzle make amazing gifts of the ocean for anyone who loves the sea and nautical decor, or beach decor. Great to have and dream of the ocean and the beach and the sea waves and being there at the ocean. Do you remember standing still at the ocean trying to capture every sound and every nuance of light and color dancing on the waves? Can you feel the spray that lightly touched your face when you walked in the shallow surf where the waves were bouncing with foam nearby? Have you thought about the feelings of what you were seeing when the ocean waves pulled into the sand near you and tugged their way back out again? Are you reminded of the vastness of the ocean as you had looked at the horizon with its light haze and depth of surface color in the sea? When you remember what it was like at the ocean – can you recall its colors, its feeling, the color of the sky and the ways it changed moment by moment? These are the things you need to know in order to paint ocean waves and capture the feeling of the scenes you remember. The ideas of time and change are all in you – they are in your memories and you can recall them. Every moment at the sea, there is change – there is motion – there is a feeling, an essence and an idea that is captured in your memories. It isn’t only what you felt at the time, or your thoughts, or what was happening in your life at that time. There is something of the sea and the ocean’s spirit and power that is there too. Sometimes, when I create – there is nothing but a request to my mind for a memory, a feeling or an essence of a time at the ocean. There is a sunset that comes to my mind with a looming storm beyond the horizon whose clouds are catching the last rays of the sun in brilliant colors against a lavender sky. There is a time when I was afraid to stand on the shore because the power of the waves crashing into the sand were so much greater than me and the winds drove the salty spray of the waves into my skin stinging as it came. But the colors – ooh the colors of that moment drove me to distraction to understand their shades and hues and subtleties. The sand felt different, the sea felt distant, though I stood right beside her, and the sky was filled with unusual textures and colors that I would love to describe in paint. There are intricacies to painting which are like nothing else because from the mind of the artist directly to the mind of the viewer there is no boundary – no wall – no caption or remark to make. It is a direct route of communication without limitation in an immediate, encompassing sense. The best way to describe this is for you to choose a moment to capture in paint, let go of all your pre-conceived notions of how to go about it, let go and paint it. Make it so. Let the paint describe all of what you saw, all of what you experienced and all of what you felt in that moment. Push all the judgements about how it should be done or how it should look – out of your mind and let the paint be an extension of what you know. Then let someone see it and see what they see. There is nothing you can say that will add to their experience with it. The moment they have seen it, something has passed between your mind and theirs directly. Infinitely, genuinely and honestly – they have been given some part of that experience as you remembered it. If you want words for what they have seen – ask them, but often words fail to accurately describe experiences like this and many people fall back on whether they like it or not and try to get you to talk more about it. Do you remember the sky, the day you stood at the ocean on a summer day? Can you feel the warmth of the sand under your feet and the clean smell of the gentle breeze that brought the sounds of people drifting on it? Did you ever walk on the beach at night or wade in the water as the sun was sinking below the horizon? Do you remember the sparkly little foam that you kicked halfway across to the moon as you walked in the cool water with the wet sand tugging under your feet at each step? Can you recall what the sky looked like as the moon and stars lit the sea like thousands of tiny diamonds bobbing up and down with each little crest of a wave? There are thousands of moments in each day and as we stand in the realm of the ocean’s power – her force is evident in seemingly infinite changes within each of those moments to everything surrounding her. The sky isn’t the same from one moment to the next – the colors fade toward the horizon one moment and some other time – the hue is deeper there. The foam on the sand ebbs and flows with the surf, but the reflections in it are never the same. Wet sand, dry sand are definitely different colors – yet, warm sand is many shades and cold sand seems grey whether it is or not. Set up a horizon on the surface to paint. Remember a moment to capture. Define the sky with colors, swirls, textures, clouds and reflected light. Play in the paint to achieve effects that describe details to include. Stop touching it – the moment any part of it looks right. Don’t fix it. Just do another one and each one will get better. Enhance waves, shadows, contours and specific elements carefully – because it will change what you already have right. And, last of all – remember – it is perfect because you did it this way today, this time and in capturing this one moment this way. Let it go and do another one. Happy painting and creating wonderful things. am trying to lern to paint ocean water, transparent water with little waves on a beach .Do you have any DVDs that I can buy, or suggest some to me,that would be good, and where I can get them,Thankyou, MILAN CVJETIC. Imagine what the finished piece will be and the moment that you want to capture. Everywhere there is to be sparkle, foam or waves – don’t put any paint there. Don’t wet the entire watercolor paper, but instead paint with limited areas of wetness across the page from side to side where the foam, sparkle and froth of the waves will not be. Sounds pretty backwards, doesn’t it? In essence, paint everything in deep hues where the sea is getting deeper away from the viewer until it nears the horizon while leaving the irregular shapes of the wave crests near the viewer and where there are hints of building waves in the middle behind the detailed areas in the foreground. There is a dry brush technique that works great for sparkle in watercolor – try it first on a separate piece of watercolor paper. Fill the dry paintbrush (stiff bristles have one set of effects, soft bristles have a different look done this way) with paint by gently, lightly dragging it across the top of the paint so it doesn’t fill the bristles completely. Then pull the color across the page drifting it across the surface in one smooth motion. Each swipe across the surface will fill in some of the color under the sparkle. This isn’t white paint in the brush, although you can do that with acrylics or oil paints. For watercolors, the paper provides the only pure white in the painting, so when the sparkle happens – it is literally the paper showing through the other colors that convey visual information beneath the foam, the spray, the breaking wave froth, and the sparkly little bits that to the viewer seem to be on top of the water. It is easy to fill the brush with several colors of the water and sand to drag across the paper in front of a breaking wave to convey the sparkly foam in the shallows where we would splash and dig our toes into the wet sand. 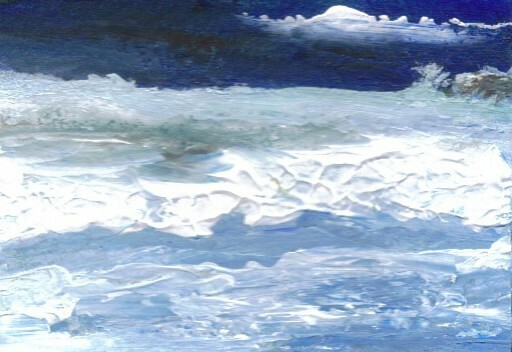 There is a little shadow beneath each wave’s crashing froth – it can be created with a light wash with only a hint of wet pigment slightly darker than the sea water and depending on the time of day in your painting, the frothiness of the wave can be captured with swirls of very, very thin prussian blue washes blended gently into the areas of white or using lightly wet soft bristles partially filled with a very, very thin wash of payne’s grey. Try it on another piece of paper first. The clouds and sky will be the same thing – where there are white volumes of clouds must be left unpainted because where the white paper is ever given a tint, it will never be white again. The horizon at certain times of day and in some weather conditions will be almost invisible and lighter than the surrounding upper sky or deep ocean areas. And, at other times it is well-defined and occasionally, deeper in color. What looks right in your mind’s eye? Clouds can be defined from the white surface of the paper using light thin washes of blueish purple, grey, or cobalt that develop the curving forms of shadows beneath their fluffy round forms. Sunsets and sunrises, afternoons and dusk, all have particular tints to everything. As long as the tints match throughout the painting, it can be believable as if your viewer is standing at that place at that time of day. The best thing to do is to have some fun with experimenting to find the different effects that can happen, but the basic rule for painting in watercolor is that white areas are left clean and lightly developed, lighter values go on first and each layer of color builds to the darkest which is painted last, rather than first as in acrylics and oil paintings. Great fun painting – can’t wait to see the results! In this watercolor pocket art card that I created, a snuggly kitty is doing what dittling about that happens when cats are in my life – playing with my toys . . . 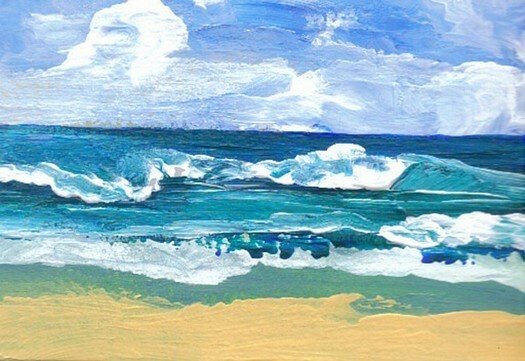 Note – this painting above may be watercolor and acrylic or china white watercolor paint riding over the transparent watercolors for the white of the surf and foam in the foreground. I experimented with a lot of different techniques and tried different ways to get the ocean to look the way I remembered it. If it feels like I could splash my feet in it – then, it works as far as I’m concerned. 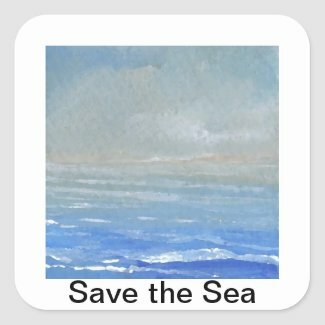 This page has the small things with some of the ocean images that I’ve painted and I’ve figured out that if everybody buys one small thing – I will be able to fund starting my business properly – so I’m asking – please do . . .
A little magnet costs about $4 and it would help me to really get started making this into a real business with some appropriate startup funding. Thanks so much for wandering over to my blog and reading the things here and I do appreciate your interest – its very nifty. 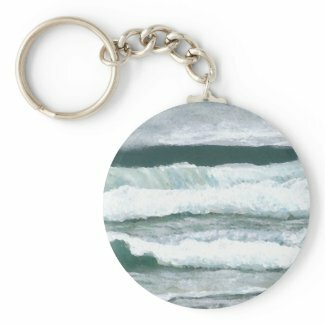 Ah, and the actual store is here – but there is a lot of things on it besides ocean waves art and the category “Small Things” has a lot of images that I’ve created and put on products which would be very little to own, less than $10 for any of them. so everybody go buy one – — LOL, but definitely, yes please do. The other day, I went to make the products with the cat playing with mama’s sailboat watercolor that I did and the zazzle site got buggared just as I was doing them – although it only lasted a few minutes, it means that those products are waiting to be completed. The art is already uploaded and it will just take a little while to get them made and then a day or two before they can be seen on the site once I’ve made them. Please check back in a few days if you would like things with that cutest little cat thing on them – and they will be there. Yes, very nifty . . .